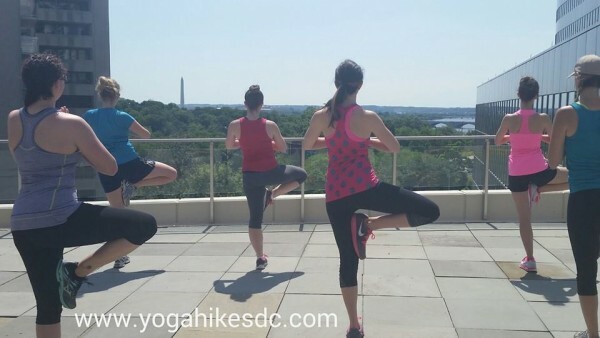 Yoga Hikes DC is very excited to be invited by the Rosslyn Business Improvement District to come back to Rosslyn, VA, this time for two months – May and July! 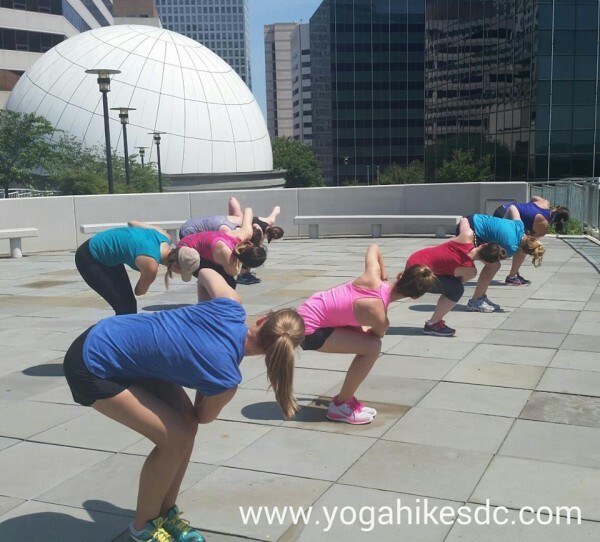 Our urban Yoga Hike is unlike any other outdoor workout in Rosslyn. You will go hiking through 5 different parks (Gateway, Highlands, Hillside, Dark Star, and Freedom Park) and stop in 3 of them for roughly 15 minutes of yoga (total of 45 minutes). These urban hikes follow our signature Yoga Hikes format of 15 min. yoga/15 min. hiking intervals for 90 minutes through the parks and up the hills of Rosslyn, VA. MEETS AT: the street level offices of the Rosslyn Business Improvement District (BID) located at: 1911 North Fort Myer Drive, LL-10, Arlington, VA 22209 (next door to the side of Continental Pool Lounge facing Gateway Park). Space is limited, please sign up early! You can find these classes on our MindBodyOnline registration site. These classes are Special Events and not held the entire summer, but the cost is the same as our regular single hike drop in ($25) or 3 hike pass ($60). All classes are available for registration now. Sadly, our online registration system had some glitches last week, but they are now fixed! If you do encounter ANY trouble registering whatsoever, please do not hesitate to contact us immediately by email danielle@yogahikesdc.com or phone (202)670-6120. We are eager to help you and look forward to leading you out on the trails this season! Never fear nature lovers! Our fan favorite Nature Yoga Hikes are also starting up in Rock Creek Park in May. Join instructors Rachel Wimberley and Krista Mason for hikes up your favorite hills and along your favorite dirt trails through out May on Sundays. This season we are mixing up locations to give you more variety on Sundays! Yoga Hikes with Krista will begin at 9am at Peirce Mill every other Sunday. 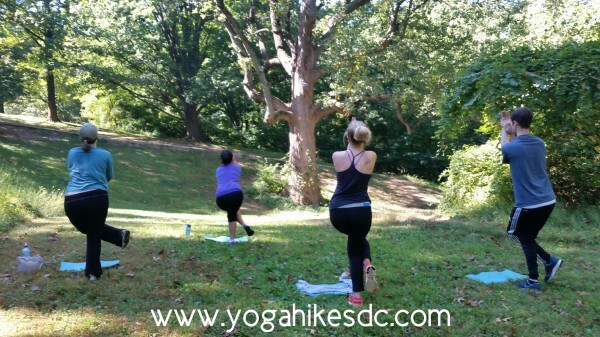 Yoga Hikes with Rachel Wimberley will be at 10am in Woodley Park (through Dumbarton Oaks) on select Sundays. Please be sure check the schedule for time, location, and instructor! Sara is a registered yoga instructor through Yoga Alliance (RYT 200) and graduate of the prestigious Mimi Rieger Teacher Training Program. A student of yoga for over a decade, Sara began accelerating her practice during (and while recovering from) a full term twin pregnancy. Through this experience, Sara is equally comfortable working with advanced students and those new to their practice. When not training and teaching yoga, Sara is a Certified Public Accountant (CPA) in the State of Virginia and is dedicated to supporting the local nonprofit community. Sara is a graduate of Ohio University and is the winner of the 2014 Nonprofit CFO of the Year Award, Rising Star. We love having Sara on the Yoga Hikes team. She is upbeat, compassionate, and fun! A resident of VA, Sara will be leading most of our Yoga Hikes Virginia.